The film stars Ellen Barkin as Lynn, a mother of four who must deal with her abrasive family and abusive ex-husband at the wedding of her older son. 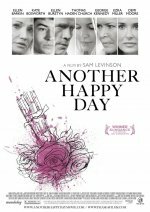 Another Happy Day release date was Friday, November 4, 2011. This was a Limited in theaters release. Director/screenwriter Sam Levinson wrote the film in 2007 when he was 22 years old. He's the son of director Barry Levinson.